When a book is short-listed for the Children’s Book Council of Australia awards, I feel safe making the assumption that it’s special. When it wins its category, I am eager to see if I agree with the judges about its extra-specialness. 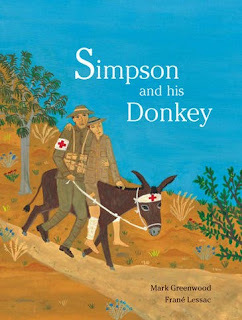 Simpson and his Donkey was written by Mark Greenwood, illustrated by Frané Lessac, and published by Walker Books Australia. Last month, it won an honour award in the Eve Pownall Book of the Year 2009 section of the CBCA awards. Like most Australians of my vintage, I am familiar with the story of John (Jack) Simpson Kirkpatrick, who used a donkey to rescue wounded soldiers during World War I, but I was keen to read this version of the tale. It’s a wonderful book. Greenwood uses a writer’s tools precisely to set scenes, evoke atmosphere, and tell Jack’s story. This is tight, active writing at its best. Turkish machine guns snickered, whipping up spouts of water. Jack felt the zip of a bullet pass by his head. He tumbled into the icy Aegean Sea and waded to shelter beneath an overhang. Soldiers stormed the beach under orders to secure higher ground. They fixed bayonets and charged up the razorback ridges. Enemy artillery exploded overhead, showering the cove with fiery shrapnel. But this is not just a story about a battle. It shows us the human side of war, the courage, the waste of human life, the brotherhood engendered among men fighting for a common cause. When Jack was just a lad in England, before he sailed off to Australia and adventure, he vowed never to forget his young mate, Billy. Billy was one of more than three hundred men whom Jack rescued at Gallipoli. Lessac was an inspired choice as illustrator of this appealing book. Her naïve style complements the simple, evocative tale. As in all excellent picture books, the visual text amplifies and adds to the written words, so that we understand the reality of the battle. There is much detail for children to ponder over – vignettes of soldiers digging trenches, soldiers with head wounds, soldiers on stretchers, and one man with a donkey. It’s tremendously important for Australian children to read stories about real Australian heroes. This picture book brings Simpson’s story to life for young readers, and helps them understand about a defining moment in Australia’s history. It would make an excellent resource for a library, or any family wanting to uphold the spirit of the ANZACs.